A heartbreaking loss after a stunning win denting their confidence, India will still be fired up by the prospect of a maiden knock-out round berth when they take on Bahrain in their final Asian Cup group league match here on Monday. AFC Asian Cup: Sunil Chhetri-led India will start favorites against Bahrain in their last group match. A heartbreaking loss after a stunning win denting their confidence, India will still be fired up by the prospect of a maiden knock-out round berth when they take on Bahrain in their final Asian Cup group league match here on Monday. A draw against the West Asian side, currently ranked 113, will be enough for India (ranked 97) to qualify for the round of 16 for the first time in the continent’s showpiece event after failed attempts in 1984 and 2011. 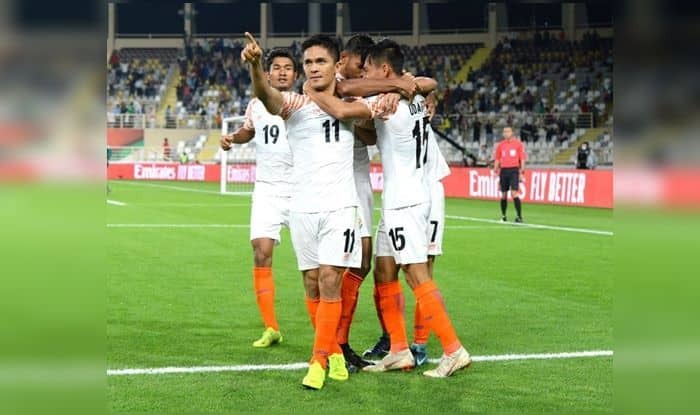 Courtesy, the stunning win against Thailand has shown that India is no longer an ‘also ran’ side and the second match against the UAE — though lost 0-2 — strengthened the thought that this side can hold onto their own without fear and take the game to the opposition, unlike the teams of the past. The Thais defended deep in the first half against Bahrain and hit on the counter and the ‘War Elephants’ were able to get a second-half goal. So, it is not beyond India’s reach to get a favourable result against Bahrain. Constantine fielded the same starting eleven in both against Thailand and UAE in a 4-4-2 formation and it will have to be seen whether he does the same against Bahrain. The central defender duo of Sandesh Jhingan and Anas Edathodika largely marshaled the back-line well so far but there were periods of lack of understanding between them which led to the two goals by UAE. The head coach is unlikely to make changes at the heart of the defense as well as in the upfront duo of Chhetri and Kuruniyan. However, Constantine may try out Balwant Singh at some point in time considering the physicality of the Bahrain side. Jeje Lapekhlua has been the preferred forward for Constantine to come in as a substitute. with striker Shabir Ali scoring both the goals. Bahrain has won on five occasions win while one match had ended in a draw.